Description: . This is the second of the two Stlaams in Tiruchirappalli, the first being the Rock Fort Temple. Uraiyur was the ancient capital of the early Cholas and the ancient city is believed to have been destroyed by a sand storm. Pugazh Chola Nayanar and Go Chenkan Cholan were born here, as was Tiruppaanaazhwar. Also known as Mookkeeswaram this shrine is considered to be the 5th in the series of Tevara Stalams in the Chola kingdom located south of the river Kaveri. Legends: Garuda, Kasyapa Muni and Karkotakan are said to have worshipped here. Shiva is said to have manifested himself in five different shades of color to Utanga Munivar (Ratna Lingam in the morning, Spatika Lingam at noon, Gold Lingam in the afternoon, Diamond lingam at night and Chitra lingam later on at midnight). Uraiyur is also known as Kozhimanagaram as legend holds that a fowl blessed with divine powers defeated an elephant in an duel. Go Chenkan Cholan the builder of 78 Maadakkovils is said to have born here. 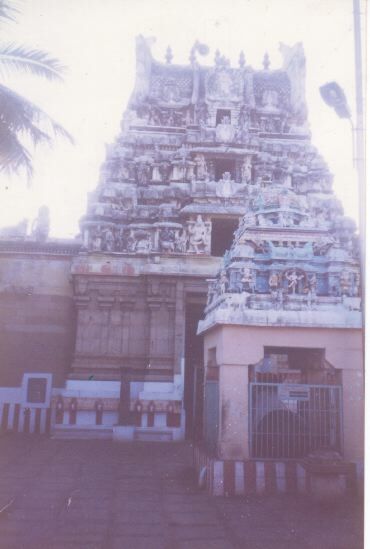 Several legends are associated with this temple and the one involving the merger of 6 Shivalingsms into one, is commemorated in the month of Vaikasi during the annual festival. This legend states that a Chola king saw the five daughters of Nagarajan worshipping a Shivalingam each, on the banks of the Nagatheertham. He married the youngest of these princesses and requested his father in law for the Shivalingam that was held in worship by Nagarajan. Nagarajan handed over a half of the Shivalingam to his daughter, who in turn handed it along with the five Shivalingams worshipped by the siblings; all of these merged into one under a Vilva tree, under which, this temple originated. The Temple: The Shivalingam held in worship here is very small in size. There are shrines to Ambal, Vinayakar, Subramanyar and Mahalakshmi here. The sanctum faces east while the Ambal shrine faces south. Images of Ganesha, Dakshinamurthy, Vishnu, Bhrahma and Durga occupy the niches around the sanctum. There is a shrine to Utanga muni directly across from the Nataraja shraine. The temple is replete with sculptural work depicting legends associated with the temple. For instance there are wondrous pieces of sculpture on some of the temple pillars that appear as four women from one angle, and as a horse from another. Festivals: Four worship services are offered each day. The annual Bhramotsavam is celebrated in the month of Vaikasi, and the Panchapraharam festival in the month of Aadi. Templenet acknowledges Mr. C. Vedanarayanan (UK) for his contribution of the image of the Uraiyur temple tower shown above.